The Oakland County Bar Association presented “You Have a Law Degree, Now What?” as a part of its OCBABC’s of Practice seminar series on Tuesday, Feb. 12, at the Oakland County Bar Center in Bloomfield Hills. Taking part in the program were (seated, left to right) Victoria King with the Oakland County Circuit Court, Thomas M. Cooley Law School Professor Monica Navarro, and Iwona Villaire with Cooper-Standard Auto motive Inc.; along with (standing, left to right) Matt Allen with Miller, Canfield, Paddock, & Stone PLC; Jennifer Grieco with Neuman Anderson; Syeda Davidson with Lakeshore Legal Aid; Jeffrey Hall with the Oakland County Prosecutor’s Office; Lisa Hamameh with Adkinson, Need, & Allen; and Royal Oak attorney Michael Hamblin. “We’re targeting new lawyers to try and give them an idea of how to get a job in today’s economy,” said Hamameh, chair of the seminar series. 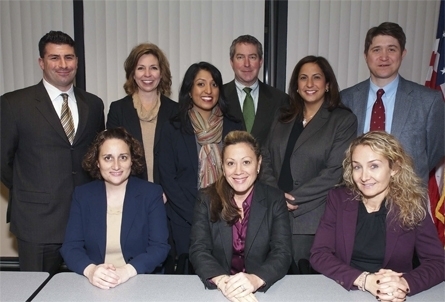 Part two of the series featured a roundtable discussion of different legal careers. The panel consisted of an attorney from a large firm, an attorney from a small firm, somebody from free legal aid, a teacher, a prosecutor, and a solo practitioner. “The idea is really to have them all talk about how they got their job and what a typical day in the life is so the new lawyers have an idea of what they’re getting into and how to get the jobs,” Hamameh added.